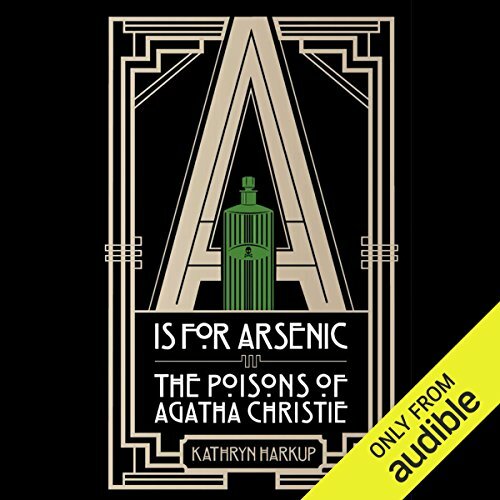 ©2015 Kathryn Harkup (P)2015 Audible, Inc.
Would you consider the audio edition of A Is for Arsenic to be better than the print version? Probably the audio, I really enjoyed the audio version and I have listen to it more than once. I think this would be a book that I would like to own both in audio and print. No characters as this is a nonfiction book. I am a huge Agatha Christie fan and I absolutely loved this book. To get facts about Agatha, her murderers and the poisons all in one place is wonderful ! Her accent was great. This is the first time I have listened to her work and I would be happy to listen to her again. Yes, I hated to stop when I had to take a break. This was actually pretty interesting, however, it did drag a bit in some of the more technical parts. Overall though I would recommend it...especially to Christie fans. What made the experience of listening to A Is for Arsenic the most enjoyable? Beth Chalmers was an ideal narrator, capturing the Britishness of the book and dealing well with the technical detail. This is a little tough as an audio book, since the author goes into quite technical descriptions of nerve receptors, molecule shapes, and the functioning of body cells. I found myself losing the thread fairly often in these parts as I listened in the car. If you could sum up A is for Arsenic in three words, what would they be? What was one of the most memorable moments of A is for Arsenic? Her description and the way Agatha Christie used her experience. Have you listened to any of Beth Chalmers’s other performances? How does this one compare? No, not yet but intend to. Thoroughly enjoyed, did not think I would have. Bought it because of Agatha Christie. A really interesting listen. And educational too. Narrator did a great job. Off to find more books read by her and more by the author too! It was spoiled by the narrator sounded far too young and good humoured for the subject matter. A better choice would have been Patience Tomlinson or Anna Massey. Interesting premise, but somehow ended up sounding like 5hr homework assignment. Maybe it's the combination of the book and school mistress like narration style. Found it hard to listen.